Let’s say you like BAE Systems and would like to get the 13.2p/2.6% dividend. You decide to buy exposure to £10,000 worth of BAE Systems using a CFD. To do this, you need £2,000. 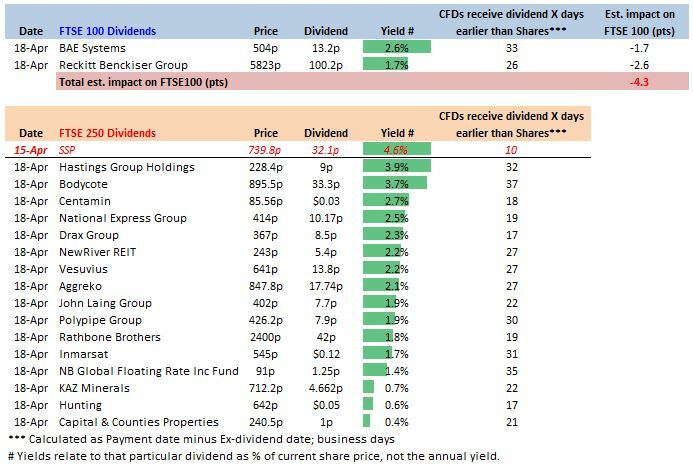 Assuming BAE Systems shares recover to their pre-dividend share price, your profit from the dividend would be £260, from your initial investment of £2,000. Be aware that the share price could fall or rise, which could mean that you make an overall loss or increased profit on the position. For example, let’s assume that BAE Systems falls 2% at the same time it pays the dividend. You overall net loss on your £10,000 position would be £200.